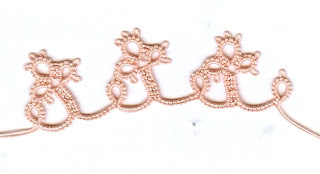 Here is another sample from the Bocher Book for the Online Tatting Class. This is a floret, it would have been longer but I ran out of thread on the shuttle so it is just a short piece. I have been working on the needle tatting for class but am still struggle with it. I can finally make a decent ring but the chain is now giving me trouble. I need to find a video online to watch maybe that will help me out. I am also working on some hairpin tatting. I find that is very time consuming I have a lot to get done before class next week. It isn't difficult and will look wonderful when I get it finished. Then I saw on InTatters they are hosting a bookmark exchange. I would like to join but my time for tatting is at a premium right now. With working and being on the road an hour and a half each way it does eat into my time. Maybe I should give up the work and just concentrate on the tatting. Hi Angie! Your sample edging looks pretty! I love the color of thread you're using. It looks like we are both using about the same color of thread for the projects we're both working on right now. This is a very pretty adging. Plus, I'm a sucker for anything in this shade of pink! Yum!